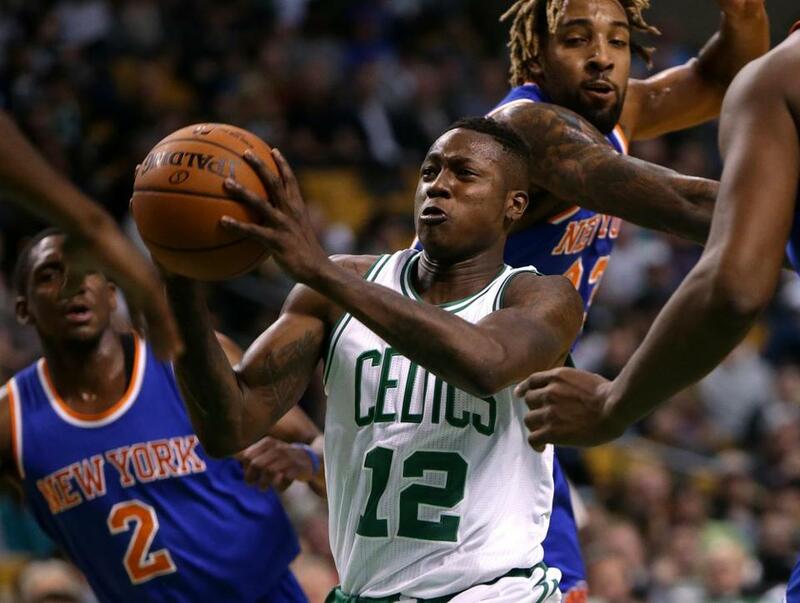 With the Celtics off Saturday, Terry Rozier was sent to Canton, Ohio, to play for the Maine Red Claws in a NBA D-League game. So the Celtics sent rookie guard Terry Rozier to NBADL Maine, where he was expected to join fellow rookie Jordan Mickey and 2014 first-rounder James Young for Saturday night’s game against Canton. Through trades over the past few years, president of basketball operations Danny Ainge was able to acquire four picks for the 2015 draft, including two first-rounders. He selected Rozier and R.J. Hunter, who has been a pleasant surprise, along with Mickey and William & Mary guard Marcus Thornton, who opted to play in Australia. Rozier going to the D-League is no demotion. For the Celtics, it’s a way to sneak in playing time and experience when the other option is inactivity. The Celtics didn’t practice Saturday, and they don’t play until Sunday evening in Oklahoma City, so why not have Rozier play in Ohio and then send him on a Sunday morning flight to Oklahoma City? It’s the organization’s way of tutoring their younger players, using the NBADL as a means of experience. It’s not a glamorous plan. Most rookies don’t get much playing time in the NBA. Only one player taken after No. 11 has played more than 100 minutes and that’s Jerian Grant of the talent-starved Knicks, who need the 19th overall pick as a backup point guard. Celtics fans can’t become impatient with the seasoning process because even those rookies expected to play immediately haven’t. Going into Saturday’s schedule, Virginia’s Justin Anderson had played 60 minutes in eight games for the Mavericks. Oklahoma City’s Cameron Payne had logged 11 minutes in four games for the Thunder. Bobby Portis was the Southeastern Conference Player of the Year and had played in two of Chicago’s first nine games. Houston’s Sam Dekker had played six minutes all season. Ainge said he understood that his rookies would need crash-course mentoring and seasoning before making an impact. While there may be disappointment among Celtics fans that three draft picks played Saturday night in Canton, there weren’t high expectations that the trio would crack the rotation, especially with the team’s depth. The consensus was that Rozier, Hunter, and Mickey would require development entering the draft. Hunter has surprised by earning key minutes in the past two weeks, playing double-digit minutes in three of the past five games, meaning the NBADL is less of a consideration. But those three players, and even Young, are hardly considered disappointments in the organization because a portion of their rookie seasons will be spent in the NBADL. It’s part of the maturation process in today’s NBA, that’s why an increasing amount of NBA teams are purchasing NBADL affiliates. Toronto and Chicago are the latest clubs to announce new teams and the NBA would prefer all 30 teams own affiliates, similar to major league baseball. The Celtics have reached a point of their rebuilding plans where rookies don’t need to play such a pivotal role as Marcus Smart did last season or Kelly Olynyk two years ago. They don’t want to force first-year players into not-ready-for-prime-time roles just to gain experience. They have Maine for that. “What I don’t want to have happen when we draft a player is for my coaching staff to have such a burden of trying to win, trying to make the playoffs, trying to win games and making judgments on their young players who can’t help them win,” Ainge said. With potentially three more first-round picks coming to Boston next summer, the Celtics want to establish a foundation in which their younger players can develop without the pressure of having to perform on the biggest stage until fully prepared. Celtics faithful are impatiently waiting on Young to make an impact with the big club, but he is expected to spend most of his second season in Maine. That may not indicate Young was a worthy draft pick, the Celtics plan to give him the most fruitful opportunity to succeed — eventually.